Fluorite (also called fluorspar) is a mineral composed of calcium fluoride (chemical formula CaF2). It is present in large deposits in many parts of the world and occurs in a wide variety of colors, including blue, purple, red, yellow, green, and white. Fluorite gives its name to the property of fluorescence, as many (but not all) samples of this mineral produce a strong glow when exposed to ultraviolet light. 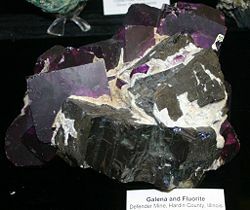 Historically, some varieties of fluorite have been used for ornamental purposes. Currently, it is used in manufacturing opalescent glass, enamels, cooking utensils, and hydrofluoric acid. In addition, it is used instead of glass in some high-performance telescopes and camera lenses. It is also a flux in the manufacture of steel. The name fluorite is derived from the Latin word fluo, meaning "flow," in reference to its use as a flux. Fluorite may occur as a vein deposit, especially with metallic minerals, where it often forms part of the gangue. It may be found associated with minerals such as galena, sphalerite, barite, quartz, and calcite. It is a common mineral in deposits of hydrothermal origin and has been noted as a primary mineral in granites and other igneous rocks. It is a common minor constituent of dolostone and limestone. Fluorite is widely distributed around the world. Notable deposits occur in Germany, Austria, Switzerland, England, Norway, Mexico, and Ontario, Canada. In the United States, deposits are found in Missouri, Oklahoma, Illinois, Kentucky, Colorado, New Mexico, Arizona, Ohio, New Hampshire, New York, and Texas. The State of Illinois has historically been the largest producer of fluorite in the United States. In 1965, the Illinois General Assembly passed a resolution declaring fluorite the official state mineral. Yet, 30 years later, the last of the mines in Illinois was closed down. Fluorite veins in the Blue John Cavern, United Kingdom. One of the most famous sites for the excavation of fluorite has been the Blue John Cavern in Castleton, Derbyshire, England. This site has yielded beautiful, purple-blue fluorite, under the name Derbyshire Blue John, which was used for ornamental purposes, especially in the nineteenth century. The name "Blue John" derives from the French words "bleu et jaune" (blue and yellow), characterizing its colors. This site is now depleted, and only a few hundred kilograms (kg) are mined each year for ornamental and lapidary use. Recently, deposits in China have produced fluorite with similar coloring and banding to the classic Blue John stone. 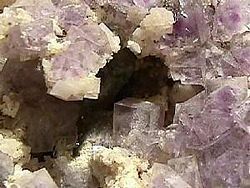 Fluorite crystals are isometric with a cubic habit, though octahedral and more complex isometric forms are not uncommon. Crystal twinning is common and adds complexity to the observed crystal habits. Light dispersion through fluorite is very low, compared to dispersion through ordinary glass. This mineral is slightly soluble in water. It reacts with sulfuric acid to form hydrofluoric acid, which etches glass. Fluorite gives its name to the property of fluorescence, as many samples fluoresce strongly when exposed to ultraviolet (UV) light. The fluorescence may be due to impurities such as yttrium or organic matter in the crystal lattice. Yet, not all fluorites fluoresce, even if obtained from the same locality. For this reason, UV lighting is not a reliable tool for identifying specimens or quantifying the mineral in mixtures. For example, among British fluorites, those from Northumberland, Durham, and Eastern Cumbria are the most consistently fluorescent. Those from Yorkshire, Derbyshire, and Cornwall are generally either feebly fluorescent or not fluorescent at all. The fluorescent color of fluorite is largely dependent on where the original specimen was located. Blue is the most common color, but red, purple, yellow, green and white also occur. Fluorite also exhibits the property of thermoluminescence. Deep purple cubes of fluorite with galena (gray) and calcite (white) from Illinois. As noted above, fluorite comes in various colors and has been used for ornamental purposes. In addition, it is used in manufacturing opalescent glass, enamels, cooking utensils, hydrofluoric acid, and as a flux in the manufacture of steel. Given the low dispersion of light through fluorite, this mineral is used instead of glass in high-performance telescopes to produce crisp images of astronomical objects even at high power. Likewise, it is used in camera lens elements. Exposure tools for the semiconductor industry make use of fluorite for optics at the wavelength of 157 nanometers (nm). Fluorite is a unique material in that it has high transparency at this wavelength. ↑ Gangue is the worthless "host-rock" in which valuable minerals occur. ↑ The wavelength of 157 nm is created by an excimer laser with F2 gas. Mineral Gallery. Fluorite, 'The Most Colorful Mineral in the World'. Amethyst Galleries. 2006. Retrieved July 20, 2007. Mindat.org. Fluorite. Mindat.org. 2007. Retrieved July 20, 2007. All links retrieved April 17, 2017. This page was last modified on 17 April 2017, at 23:16.